After the establishing of the Riga Latvian Society (RLS) it was joined by and in its commissions worked the most eminent Latvians of that time – very well known lawyers, writers, musicians, teachers, doctors, contractors and officials. The “speech men” were those who could express and defend their views, which were authorities in cultural or economic field. The “speech men” elected the society leaders, and at first they were the RLS founders. During the first few years after the establishing of the RLS, chairmen changed each other, on average, every year, but, starting with the lawyer Krišjānis Kalniņš, the Society started to bloom, when became stable the organisation's resource base, when the Society gained great success at work and full authority of the people, and when it obtained accordance between various internal groups. Studied at Terbata teachers' seminar, finished St. Petersburg’s teachers' institute, later worked as Vidzeme Chamber’s of Commerce official and the Pskov Provincial Excise’s officer. Upon his return to Riga, B. Dīriķis issued newspaper "Baltijas Vēstnesis” (The Baltic Herald) and was its editor (from 1868). In 1877 he founded the first Latvian dayly newspaper “Rīgas Lapa” (Riga’s Pages). Under his leadership, at the Riga Latvian Society were created the Theatre and Scientific commissions, set up a monument to Garlībs Merķelis in Katlakalns and was built the Society House. At the beginning he was the Vice-chairman, but from August 1870 to February 1871 – RLS Chairman. R.Tomsons studied agriculture in Germany. Worked in Riga as an accountant and as a manufacturer opened artificial dung factory, but went bankrupt. Organized the first farmers’ meeting in Riga (1872), was an active “New Latvian” (Jaunlatvietis). He acted as a journalist for “Baltijas Vēstnesis” (Baltic Herald), issued an agriculture newspaper "Darbs” (Work, 1875 -76) and an almanac "Vārpa” (Ear, 1874). At the initiative of R. Tomsons the RLS Theatre Commission was established on December 1, 1868, where he worked also as an actor and director, localized German plays, as well as he himself wrote the play "Mika is coming home”. Wrote the book "RLS’ first decade” (1878). Fr.Veinbergs attended Jelgava’s gymnasium, studied law in St. Petersburg and Moscow. From 1869 he lived in Riga and worked as a lawyer. Fr. Veinbergs was a remarkable social activist, popular journalist, the man who was graced with a sharp mind and logical thinking. He worked actively to draw together Latvians and Lithuanians. Wrote "From the Latvian and Lithuanian History" (1885). After B. Dīriķis death he led the newspaper "Baltijas Vēstnesis” (Baltic Herald). In 1902 Fr. Veinbergs founded his newspaper “Rīgas Avīze” (Riga’s Newspaper), which was against the Socialists, their theory and called for reforms. While Fr. Veinbergs was the Chairman of the Riga Latvian Society, the Society survived internal quarrels, which were distracted, but almost half of the members withdrew and the Commissions’ work was drying up. J. Baumanis was born in Riga, in Zaķusala’s anchorman’s family. From the age of 19 he worked at carpenter Stender, after that at the architect's Šēls office. With professor's Bonštets support he joined the Royal building academy in Berlin, in 1862 he joined the Art Academy in St. Petersburg, which he ended in 1865 with an architect's diploma. From 1863 J. Baumanis lived in Riga. By his projects were built more than 70 houses, including Conservatorium of Latvia, 1st Gymnasium, as well as the concert halls were the first three Latvian Song Festivals took place. J. Baumanis was a member of the Riga’s City Council and a significant patron. J. Baumanis led successfully the RLS for three years. During this time was renewed Scientific Commission, under the leadership of Ā. Alunāns activated the work of the Theatre Commission. The RLS participated in the Polytechnic Exhibition in Moscow (1872) and organised the 2nd General teachers’ conference. With succesfull economic management, it was possible to repay part of the debt for the construction of the RLS House. Kr.Kalniņš learned in Bauska and Jelgava, in Moscow ended science bias secondary school and in 1872 finished Moscow's University with Justice Candidate’s degree in science. Kr. Kalniņš worked actively in the cultural field, participated in the preparation process of the Russian-German-Latvian dictionary. Upon his return to Riga, he was for a time the newspaper’s “Balss” (Voice) editor and was actively involved in the RLS work. Kr. Kalniņš was an outstanding organizer and popular layer in Riga; under his leadership the RLS blossomed and became the centre of Latvia's social and cultural life (it was called the Golden Age in the Society’s history). Kr. Kalniņš managed 2nd Song festival, congratulated the Russian Emperor Alexander II into his 25 year celebration of the reignand, and celebrated Alexander III, with the participation in his coronation ceremony. He was businesslike; he had a good gift of speech, big personality impact and influence. Kr. Kalniņš improved the RLS statutes and developed commissions’ activities rules. His successful work was interrupted by the disease and premature death. Kr. Kalniņš’ funeral was unusually large with 500 torchbearers and a large influx of people. Fr.Grosvallds learned in Riga's province Grammar School, studied justice in Tartu and from 1870 -1875 in St. Petersburg. After graduation, Fr. Grosvalds worked at St Petersburg’s Ministry of Justice. In 1878 he went to live in Riga, where he worked as an official in court and barrister. From 1901 Fr. Grosvalds was Riga’s City councillor, in 1906 member of the Russian State Council; he worked in the Riga lawyers’ council’s board and participated in the foundation of the jurist board in 1911. Under the leadership of Fr. Grosvalds the Society established the Valuable Book Section, made a large ethnographic exhibition (1896) and founded the Society’s agricultural, medical, linguistics, etc. sections. Fr. Grosvalds led wisely and diplomatically the RLS in 1905, and also during the years 1917 -1919. Under his leadership was built the new Society’s House after the fire in 1908; was found the possibility of cooperation with Riga's and Russian State’s authorities; the Society widely celebrated its anniversaries. Fr. Grosvalds was a gentleman and a highly cultural man. He could involve in the Society’s work the richest Latvians, as well as the outstanding artists and scientists of that time. In 1919 Fr. Grosvalds was appointed to the position of Latvia's envoy in the Scandinavian countries, and he gave up his RLS’ Chairman's post. A. Kratskalns finished Moscow’s University’s Faculty of law and worked as a lawyer in Riga. He had been the RLS Vice-chairman since already 1904. A. Krastkalns had large merit for the preservation of the RLS in new historical circumstances, because Latvian State took over many of the Society’s activities’ sectors, commissions’ functions and collections in 1920s. A. Krastkalns revised the RLS statutes according to the law regarding public organizations of 1923, and in 1938 adapted them to the new law of Societies. Under his leadership the Society House was renovated, but in 1938 rebuilt and refurnished. In 1929 he established The National and Political Education Department and in 1932 Scientific committee. A. Krastkalns could strengthen the Society also after the political changes in 1934, and the honorary RLS member Kārlis Ulmanis there was a frequent visitor. He had his own "president's chair" and a separate room. The Society was a gathering place for Latvian officials, leading lawyers, military and political circles. The Riga's Rotary Club and the Social Club met here. R.Liepiņš finished Jelgava’s Science bias school, since 1911 had been studying marketing sciences in Riga's Polytechnical Institute. R. Liepiņš led Latvian refugees' supply committee in Pskov and in 1919 was a temporary government’s representative of a Northwest army. Since 1919 he had held various positions in the Ministry of foreign affairs: Finance minister of Latvia (1928. ), Latvian envoy in Lithuania (1929 - 1933), envoy in Estonia (1933 -1935), envoy in the Soviet Union (1935 -1936). Starting with the year 1936 R. Liepiņš was a Riga City Mayer. He had written the press articles concerning the economic and administrative matters. R.Liepiņš led the Public Club in the Society and involved there high state officials. From 1944 he acted in public organisations in Germany and was the unofficial Latvia’s diplomatic representative in Germany. The work of the RLS was terminated in 1940, with the beginning of the Soviet occupation. The work of the RLS was renewed on January 14, 1989. A.Kolbergs was the Chairman of the RLS from January 14, 1989, when former RLS members, their descendants and enthusiasts renewed the Society, to October 4 of the same year. A.Kolbergs was a writer and a social worker. He studied in Moscow's Poligraphy Institute’s Editor’s faculty (1966 - 1968), had been a secretary of Latvian Writers' Union (1988), the president of the Detective Genre Association (since 1989), the editor of the magazine “Atpūta” (Rest) (since 1991-present). P.Laķis was a philosopher and sociologist. He finished the History and philosophy faculty at the University of Latvia (1976). Had been lecturer at the University (1976 - 1990) and has acted actively in Latvian Popular Front. He was a member of the Supreme Council of the Republic of Latvia (1990 - 1993). On December 20, 1990 he founded the Latvian Culture Academy and was its rector (since 1991). P. Laķis made arrangements for the RLS House to be given over to the renewed Society. J.Velde was a doctor and a bustling cultural worker. Under his leadership, the RLS House in Merķeļa Street 13 was taken over from former USSR War Department. The cleaning of the house took place and recommenced the work of the RLS artistic groups. The most important task for the RLS Board at that time was to start economic activities to provide means for the maintenance of the RLS House. J.Graudonis was a doctor of historical sciences and an archaeologist, active public employee. J. Graudonis graduated University of Latvia (1949), was a teacher; from 1958 a researcher at the Latvian Academy’s of Science History Institute. As an archeologist he studied Latvia's castle mounds and stone castles (Alotene, Ikšķile, Turaida castles). He was one of the founders and leaders of the Latvian Nature and Monuments Conservation Society (1960 - 1969). J.Graudonis worked at the Latvian Scientists’ Union and Cultural Fund. At the beginning of the 1993 the RLS experienced a critical situation in which settled question whether the Society would be the centre of Latvian culture or the benefit of greedy businessmen. Only the Dr. of history science and archaeologist’s Jānis Graudonis’ and the RLS Board’s consistent position let the RLS to overcome the crisis situation and save the Society as Latvian cultural organization. P.Pētersons was a playwright, theatre critic and translator. He gratuated from French Lycee (1934 - 1942) and the State Conservatorium of Latvia Theatre Faculty’s Director’s section (1953). He worked as an actor (1946 - 1950) and director (1953) in Daile’s theatre. From 1964 to 1971 he was the leading director of the theatre. P.P’tersons was a significant person also as a drama theoretician; he was the author of more than 200 articles and article items. His aliases were: J. Runcis (Cat), P. Stumbrs (Trunk). P. Pētersons worked actvely at the Latvian people's front, was a deputy in Riga’s City Council and an artistic director of the grand performances of state importance. P.Pēterson’s deep erudition, wide relations, purposeful work gathered in the Society the best Latvian artists, scientists and creative intelligence, and in a few yers time the Society became the “culture and social responsibility center”. The Chairman created a powerful and talented team that organised the RLS jubilee celebrations, Days of Latvian Regions in the RLS house, took part in the establishing of the Latvian Intelligence Union, organised discussions about important for the Society problems, called together world’s Latvian societies’ conference, implemented large events and fulfilled serious projects. The RLS became an important cultural and social life centre. 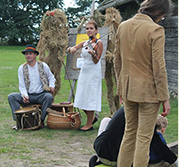 The RLS commissions and artistic groups created original, outstanding events and promoted cooperation with Latvian regions and their cultural workers. After P.Pēterson’s intiative were organised regular lecture evenings and worked different interests groups. P.Pēterson’s sudden death interrupted his ambitious work at the Society. He was born on September 26, 1936 in Preili parish. In 1963 J.Streičs graduated from the State Conservatorium of Latvia Theatre Faculty’s Director’s section and started immediately working in Riga’s Film Studio. He has participated in the creation of more than 30 cinema’s films; as a director he has shot 17 films, including " My Friend Light-Weight Man ", “Theatre ", "Te Limousine in Midsummer Night’s Colour”, "The Unknown Passion", "The Son of a Man", "Mill of Destiny”. J. Streičs is a winner of several international film festivals, the Honorary member of the Latvian Academy of Sciences and officer of the Order of the Three Stars. J. Streičs stressed that the RLS is "the Society of work". On his own initiative was started the decoration of the RLS House, improved cultural and artistic activities, in the House were exhibited outstanding Latvian artists' works. Starting with the 2000 began an annual cultural program called "Light Beckoned" that was devoted to the outstanding personalities in the remembrance years of their significant anniversaries, involving in the programme’s organising process the people of their native regions. V.Rūmnieks was born on October 6, 2005 in Riga. In 1974 he graduated from the Latvian State University’s Philology faculty’s Latvian language and literature section. He has worked in the spheres if literary theory, journalism, and management of creative organisations. From 1998 to 2004 V.Rūmnieks was a chairman of the Latvian Writers' Union. He is the author of many children books. Together with A. Migla he has written the historical novels „The Cours Vikings” (1998), „Hi, Merry, Roger!” (2005), and several plays. He is the Honorary member of the Latvian Academy of Sciences and has been awarded with the Order of the Three Stars (2002). Under the leadership of V.Rūmnieks developed the cultural programme „Light Beckoned”, the cycle of World Latvian societies’ conferences, strengthened the cooperation with the Latvian Academy of Sciences, and the RLS House welcomed many important international events, including the NATO organized meeting events for the states’ and government’s leaders in November 2006. I. Čaklais was born on April 27, 1971 in Riga. In 1993 he graduated from the Latvian Academy’s of Music Theatre and cultural education work faculty’s Director’s section. In 1995 he graduated from the University’s of Latvia Department of pedagogy and psychology and obtained a masters degree in pedagogy, in 2007 he graduated from the Baltic International Academy’s Faculty of law with a bachelors degree in law and in 2009 the Baltic International Academy’s master’s programme with a professional masters degrees in civil law. On August 3, 2011 Guntis Gailītis was elected a Chairman of the Riga Latvian Society.